Folk hero. Songwriter icon. Living legend. Buffy Sainte-Marie is all of these things and more. 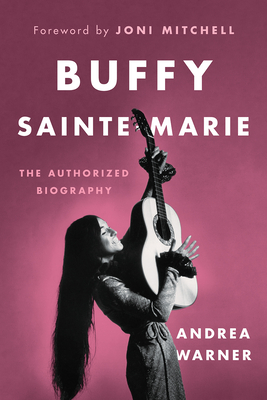 In this, Sainte-Marie's first and only authorized biography, music critic Andrea Warner draws from more than sixty hours of exclusive interviews to offer a powerful, intimate look at the life of the beloved artist and everything that she has accomplished in her seventy-seven years (and counting). Since her groundbreaking debut, 1964's It's My Way , the Cree singer-songwriter has been a trailblazer and a tireless advocate for Indigenous rights and freedoms, an innovative artist, and a disruptor of the status quo. Establishing herself among the ranks of folk greats such as Joni Mitchell and Bob Dylan, she has released more than twenty albums, survived being blacklisted by two U.S. presidents, and received countless accolades, including the only Academy Award ever to be won by a First Nations artist. But this biography does more than celebrate Sainte-Marie's unparalleled talent as a songwriter and entertainer; packed with insight and knowledge, it offers an unflinchingly honest, heartbreakingly real portrait of the woman herself, including the challenges she experienced on the periphery of showbiz, her healing from the trauma of childhood and intimate partner violence, her commitment to activism, and her leadership in the protest movement.